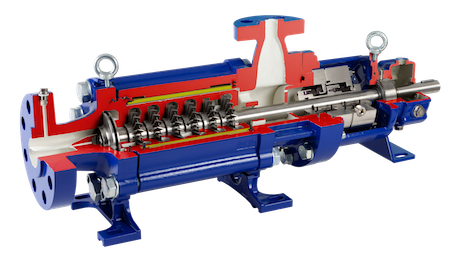 Model SHP™ is a new generation of SERO side channel pumps. The SHP™ hydraulic remains focused on low flow applications, but now the SHP™ is capable of producing heads upwards of 3500’ with a maximum allowable working pressure of 1450 psig (100bar). In addition to the enhanced hydraulic coverage, the SHP™ pump design closely follows API-610 specifications, where applicable. For example, API material codes S-6, C-6 and A-8 are offered. Dual containment, liquid end barrel design is standard with ANSI 900 lb flanges that will meet the 610 nozzle loading requirements. Numerous sealing options are currently available with a sealless mag drive design due in 2015. The Model SHP™ pump is a strong alternative to high speed centrifugal process pumps and small reciprocating pumps. Eliminate pulsation problems. Reduce maintenance costs. Control fugitive emission / pollution factors. Consider the SERO Model SHP™ high pressure pump. The True Solution! Heavy duty side channel pump incorporating many API 610 features. Head to 3,500 ft at 3500 RPM. No high speed gear boxes!